If you used submodules before, you certainly got a few scars to show for it, probably swearing off the dang thing. Submodules are hair-pulling for sure, what with their host of pitfalls and traps lurking around most use cases. Still, they are not without merits, if you know how to handle them. In this post, we’ll dive deep into Git submodules, starting by making sure they’re the right tool for the job, then going through every standard use case, step by step, so as to illustrate best practices. Submodules, like subtrees, aim to reuse code from another repo somewhere inside your own repo’s tree. The goal is usually to benefit from central maintenance of the reused code across a number of container repos, without having to resort to clumsy, unreliable copy-pasting. Are they the right tool for the job? There are a number of situations where the physical presence of module code inside container code is mandated, usually because of the technology or framework being used. For instance, themes and plugins for Wordpress, Magento, etc. are often de facto installed by their mere presence at conventional locations inside the project tree, and this is the only way to “install” them. In such a situation, going with submodules (or subtrees) probably is the right solution, provided you do need to version that code and collaborate around it with third parties (or deploy it on another machine); for strictly local, unversioned situations, symbolic links are probably enough, but this is not what this post is about. On the other hand, if the technological context allows for packaging and formal dependency management, you should absolutely go this route instead: it lets you better split your codebase, avoid a number of side effects and pitfalls that litter the submodule space, and let you benefit from versioning schemes such as semantic versioning (semver) for your dependencies. If the technological context allows for packaging and formal dependency management, you should absolutely go this route. Honestly, if you can manage your code dependencies by packaging reused code cleanly in “centralized” modules and using dependency management tools, do it. For real. Honest. This will save you a world of pain (and you don’t necessarily have to publish your packages out in the open, these systems often allow for private packages too). Still, if you have a solid requirement to embed reused code right inside the container code, then you are left with a choice between submodules and subtrees. In general, subtrees are better. Hey, I’m doing a bang-up job of selling you this post, aren’t I? The fact is that submodules and subtrees are radically different, almost opposite in fact, be it in their concepts or their behavior. Most people go with submodules for a few common reasons. Submodules have been around for a good long while, have their own Git command (git submodule), detailed docs, and a behavior not entirely unlike Subversion externals, which makes them feel falsely familiar. Adding a submodule is very simple (a quick git submodule add), especially compared to adding a subtree. Only later do all the pitfalls and traps come and bite everyone, every day. It’s precisely because submodules have caused so many poor unsuspecting Gitters pain that we chose to cover them first, and subtrees later (our next in-depth article). Still, sometimes, submodules are the right choice. It’s especially true when your codebase is massive and you don’t want to have to fetch it all every time, a situation many tentacular code bases grapple with. You then resort to submodules so your collaborators don’t necessarily have to fetch entire blocks of the code base. Various open-source projects use submodules for precisely that reason (or because of heavy modularization not natively handled by their main language’s ecosystem). You should also strive for submodule code to remain independent of particularities of the container (or at least, rely on external configuration to handle such particularities), as submodule code is central code, shared across all container projects. Working around this by littering your submodule repo with container-specific branches is like opening Pandora’s box: it’s abusive coupling, going against modularization and encapsulation principles, and is sure to come back and bite your ankle at some point. Using Git with GitHub? Want to become a true GitHub master? We released part 1 of our best-of-class GitHub video training series! 5 hours, 69 videos, amazing contents for beginners and experts alike! Learn more. A quick reminder of terminology first: with Git, a repo is local. The remote version, which is mostly use for archiving, collaboration, sharing, and CI triggers, is called a remote. In the remainder of this text, whenever you read “repo” or “Git repo”, remember it’s your local, interactive repo (that is, with a working directory alongside its .git root). Submodules rely on nesting repos: you have repos within… repos. The module has its own repo, somewhere inside the working directory of its container repo. In practice, since Git 1.7.8, submodules use a simple .git file with a single gitdir: line mentioning a relative path to the actual repo folder, now located inside the container’s .git/modules. This is mostly useful when the container has branches that don’t have the submodule at all: this avoid having to scrap the submodule’s repo when switching to such a container branch. Be that as it may, the container and the submodule truly act as independent repos: they each have their own history (log), status, diff, etc. Therefore be mindful of your current directory when reading your prompt or typing commands: depending on whether you’re inside the submodule or outside of it, the context and impact of your commands differ drastically! The container and the submodule truly act as independent repos. Finally, the submodule commit referenced by the container is stored using its SHA1, not a volatile reference (such as a branch name). Because of this, a submodule does not automatically upgrade which is a blessing in disguise when it comes to reliability, maintenance and QA (just ask Subversionians using externals how many times they have to specify --ignore-externals in their commands to avoid untimely upgrades…). Because of this, most of the time a submodule is in detached head state inside its containers, as it’s updated by checking out a SHA1 (regardless of whether that commit is the branch tip at that time). Submodules are a weird balance: easy to set up, fraught with peril the entire rest of the project’s life: whereas a simple git submodule add suffices to set one up, all contributors to the repo will from then on have to be especially watchful to avoid issues. Obviously, this is a dangerous approach. Because constant vigilance does not work. Ever. 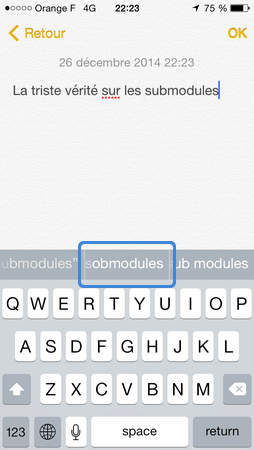 It’s no accident, I guess, that autocomplete on iOS sometimes suggests “sobmodules” about them. In this article, during the upcoming step-by-step, we’ll detail what the pitfalls are, and what can be done to alleviate or even neutralize most of them, through CLI options or configuration settings. But for now, let’s quickly list what traps there are. Every time you add a submodule, change its remote’s URL, or change the referenced commit for it, you demand a manual update by every collaborator. Forgetting this explicit update can result in silent regressions of the submodule’s referenced commit. Commands such as status and diff display precious little info about submodules by default. Because lifecycles are separate, updating a submodule inside its container project requires two commits and two pushes. Submodule heads are generally detached, so any local update requires various preparatory actions to avoid creating a lost commit. Removing a submodule requires several commands and tweaks, some of which are manual and unassisted. In short, folks, we’ll need to know what we’re doing. We’ll now explore every step of using submodules in a collaborative project, making sure we highlight default behaviors, traps and available improvements. remotes contains the filesystem remotes for the two previous repos. In the example commands below, the prompt always displays which repo we’re into. So let’s go into main and use the git submodule add command. It takes the remote’s URL and a subdirectory in which to “instantiate” the submodule. Because we use paths instead of URLs here for our remotes, we hit a weird, albeit well-known, snag: relative paths for remotes are interpreted relative to our main remote, no to our repo’s root directory. This is super weird, not described anywhere, but I’ve seen it happen every time. So instead of saying ../remotes/plugin, we just say ../plugin. This furiously resembles our local config… So why the duplication? Well, precisely because our local config is… local. Our collaborators won’t see it (which is perfectly normal), so they need a mechanism to get the definitions of all submodules they need to set up in their own repos. This is what .gitmodules is for; it will be read later by the git submodule init command, as we’ll see in a moment. Aaaah, this is vastly better. The status extends its base information to add that the submodule present at vendor/plugins/demo got 3 news commits in (as we just created it, it means the remote branch had only three commits), the last one being an addition (note the right-pointing angle bracket >) with a first commit message line that reads “Fix repo name…”. Again, since Git 1.7.8, Git does not leave repo directories inside the container’s working directory, but centralizes these in the container’s .git directory (inside .git/modules), and uses a gitdir reference in submodules. The rationale behind this is simple: it allows the container repo to have submodule-less branches, without having to scrap the submodule’s repo from the working directory and restoring it later. Naturally, when adding the submodule, you can elect to use a specific branch, or even a specific commit, using the -b CLI option (as per usual, the default is master). Note we’re not, right now, on a detached head, unlike what will happen later: this is because Git checked out master, not a specific SHA1. We would have had to specify a SHA1 to -b to get a detached head from the get-go. main (master + u=) $ git commit -m "Ajout submodule plugin demo"
In order to illustrate the issues with collaborating on a repo that uses submodules, we’ll split personalities and act as our colleague, who clones the container’s remote to start working with us. We’ll clone that in a colleague directory, so we can immediately tell which personality cap we have on at any given time. main (master u=) $ cd ..
Our .git/config is now aware of our submodule. However, we still haven’t fetched it from its remote, to say nothing of having it present in our working directory. And yet, our status shows up as clean! See, we need to grab the relevant commits manually. It’s not something our initial clone did, we need to do it on every pull. We’ll come back to that in a minute, as this is a behavior clone can actually automate, when properly called. It is still a shame that Git has you do all that yourself. Just imagine, on larger FLOSS projects, when submodules have their own submodules, and so forth and so on… This would quickly become a nightmare. It so happens that Git does provide a CLI option for clone to automatically git submodule update --init recursively right after cloning: the rather aptly-named --recursive option. plugin (master + u=) $ git commit -m "Pseudo-commit #1"
plugin (master * u+1) $ git commit -am "Pseudo-commit #2"
Suppose we now want to get these two commits inside our submodule. To achieve this, we need to update its local repo, starting by moving into its working directory so it becomes our active repo. On a side note, I would not recommend using pull for this kind of update. To properly get the updates in the working directory, this command requires that you’re on the proper active branch, which you usually aren’t (you’re on a detached head most of the time). You’d have to start with a checkout of that branch. But more importantly, the remote branch could very well have moved further ahead since the commit you want to set on, and a pull would inject commits you may not want in your local codebase. Therefore, I recommend splitting the process manually: first git fetch to get all new data from the remote in local cache, then log to verify what you have and checkout on the desired SHA1. In addition to finer-grained control, this approach has the added benefit of working regardless of your current state (active branch or detached head). In the “classical” part of the status, we see a new commits change type, which means the referenced commit changed. Another possibility (which could be compounded to this one) is new contents, which would mean we made local changes to the submodule’s working directory. The lower part, enabled by our status.submoduleSummary = true setting earlier on, explicitly states the introduced commits (as they use a right-pointing angle bracket >) since our last container commit that had touched the submodule. There are no other local changes right now besides the submodule’s referenced commit… Notice this matches almost exactly the lower part of our enhanced git status display. We now only need to perform the container commit that finalizes our submodule’s update. If you had to touch the container’s code to make it work with this update, commit it along, naturally. On the other hand, avoid mixing submodule-related changes and other stuff that would just pertain to the container code: by neatly separating the two, later migrations to other code-reuse approaches are made easier (also, as usual, atomic commits FTW). As we’re about to grab this submodule update in our colleague’s repo, we’ll push right after committing (which is not a general good practice). main (master * u=) $ git commit -am "Setting submodule on PC2"
(You might not have the “Successfully rebased and updated…” and see a “Merge made by the ‘recursive’ strategy” instead. If so, my heart goes out to you, and you should immediately learn why pulls should rebase). Note the second half of this display: it’s about the submodule, starting with “Fetching submodule…”. Still, and this is critical: Git auto-fetches, but does not auto-update. Your local cache is up-to-date with the submodule’s remote, but the submodule’s working directory stuck to its former contents. At least, you can shut that laptop, hop onto a plane, and still forge ahead once offline. Although this auto-fetching is limited to already-known submodules: any new ones, not yet copied into local configuration, are not auto-fetched. Git auto-fetches, but does not auto-update. Notice how the angle brackets point left (<)? Git sees that the current WD does not have these two commits, contrary to the container project’s expectations. This is the massive danger: if you don’t explicitly update the submodule’s working directory, your next container commit will regress the submodule. This is a first-order trap. As long as we’re trying to form generic good habits, the preferred command here would be a git submodule update --init --recursive, in order to auto-init any new submodule, and to recursively update these if need be. There is another edge case: if the submodule’s remote URL changed since last used (perhaps one of the collaborators changed it in the .gitmodules), you have to manually update your local config to match this. In such a situation, before the git submodule update, you’d need to run a git submodule sync. I should mention, for completeness’ sake, that even if git submodule update defaults to checking out the referenced SHA1, you can change that to, for instance, rebase any local submodule work (we’ll talk about that very soon) on top of it. You’d do that by setting the update configuration setting for your submodule to rebase inside your container’s local configuration. And now we can use it just like we’d have used the alias. This is the hardest use-case, and you should stay away from it as much as possible, preferring maintenance through the central, dedicated repo. However, it can happen that submodule code cannot be tested, or even compiled, outside container code. Many themes and plugins have such constraints. The first thing to understand is, because you’re going to make commits, you must start from a proper basis, which will be a branch tip. You therefore need to verify that the branch’s latest commits won’t “break” your container project. If they do, well, creating your own container-specific branch in the submodule sounds tempting, but that path leads to strong coupling between submodule and container, which is not advisable. You may want to stop “submoduling” that code in this particular project, and just embed it like any regular contents instead. We can now edit the code, make it work, test it, etc. Once we’re all set, we can then perform the two commits and the two necessary pushes (it’s super easy, and in practice all too frequent, to forget some of that). demo (master * u=) $ git commit -am "Pseudo-commit #3"
demo (master u+1) $ cd ../../..
colleague (master * u=) git commit -am "Using PC3 on the submodule"
Writing objects: 100% (4/4), 355 bytes | 0 bytes/s, done. Writing objects: 100% (3/3), 329 bytes | 0 bytes/s, done. I should note there is a CLI option that will verify whether currently referenced submodule commits need to be pushed too, and if so will push them: it’s git push --recurse-submodules=on-demand (quite a mouthful, admittedly). It needs to have something container-level to push to work, though: only submodules won’t cut it. What’s more, [EDIT Jan 14, 2016] (there’s no configuration setting for this, so you’d have to standardize procedures around an alias, e.g. spush:) — starting with Git 2.7.0, there’s now a push.recurseSubmodules configurations setting you can define (to on-demand or check). You wish to definitively remove it from the current branch. Let’s see each case in turn. This has no impact on container status whatsoever. The submodule is not locally known anymore (it’s gone from .git/config), so its absence from the working directory goes unnoticed. We still have the vendor/plugins/demo directory but it’s empty; we could strip it with no consequence. The submodule must not have any local modifications when you do this, otherwise you’d need to --force the call. Any later subcommand of git submodule will blissfully ignore this submodule until you init it again, as the submodule won’t even be in local config. Such commands include update, foreach and sync. This means you want to get rid of the submodule for good: a regular git rm will do, just like for any other part of the working directory. This will only work if your submodule uses a gitfile (a .git which is a file, not a directory), which is the case starting with Git 1.7.8. Otherwise you’ll have to handle this by hand (I’ll tell you how at the end). Naturally, advanced status info trip over themselves here, because the gitfile for the submodule is gone (actually, the entire demo directory vanished). main (master + u=) $ git ci -m "Removed the demo submodule"
Regardless of your approach, the submodule’s repo remains present in .git/modules/vendor/plugins/demo, but you’re free to kill that whenever you want. If you ever need to remove a submodule that was set up prior to Git 1.7.8, and therefore embeds its .git directory straight in the container’s working directory (instead of relying on a gitfile), you’ll have to break out the bulldozer: the previous two commands need to be preceded by a manual folder removal, e.g. rm -fr vendor/plugins/demo, because said commands will always refuse to delete an actual repository. diff.submodule = log (so you get clearer container diffs when referenced submodule commits changed). fetch.recurseSubmodules = on-demand (so you are confident new referenced commits for known submodules get fetched with container updates). status.submoduleSummary = true (so git status gets useful again when a referenced submodule commit changed). A few submodule-related tidbits are left to mention. Here goes. git submodule foreach lets you run arbitrary commands on all known (initialized) submodules, recursively or not; commands have access to various environment variables that state the submodule’s path, its referenced commit and the container working directory’s root path. Useful for custom scripting. git submodule status is a specific status display for submodules, recursive on request. It tells us what the referenced commits are, whether working directories stray from that, whether submodules are initialized yet or not, and even merge conflicts, if any. Faster than manually checking through your working directories. git submodule summary lists history ranges between the latest referenced commits and the ones currently checked out. This is what git status and git log display when submodule logs are enabled. git mv on a 1.7.8+ submodule directory (one with a gitfile) does the right thing: it changes the relative path inside the gitfile, updates the core.worktree reference in the submodule’s repo inside .git/modules, and updates and stages .gitmodules. git diff --ignore-submodules, just like git status --ignore-submodules, remove any submodule-related information. Country-productive IMHO. diff.ignoreSubmodules permanently zaps out submodule info from diffs. A rather bad idea, if you ask me. Also, if you enjoyed this post, say so: upvote it on HN! Thanks a bunch! Although we don’t publicize it much for now, we do offer English-language Git training across Europe, based on our battle-tested, celebrated Total Git training course. If you fancy one, just let us know!